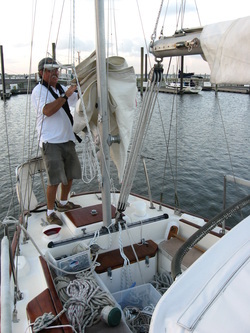 Don Marullo (broker) at Seabrook Shipyard during the survey haul out. Behind the dark glasses is Russell a young carpenter and yacht restorer. He just is finishing the new eyebrows above the portlights. 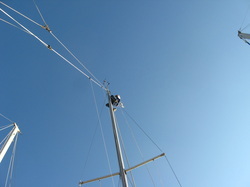 Rob is another team member pitching in to get sailing again. His main project has been the intsalation of the air conditioning. He managed to keep as much cabinet space for storage as possible though the A/C needs its space. 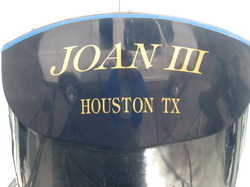 New Name by "Graphics by George"
after servicing the sails in the loft by Peter, David helped to put these back on and tuned the rigging assisted by Charles.